This document sets the conditions under which a caterer will provide food and services for a corporate or private event. 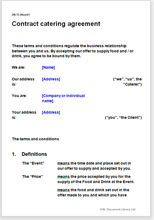 This document can be used by any professional caterer, whether a sole trader or a large company, as either a standard contract to which details of the service to be provided can be added as a schedule, or as a negotiated agreement on an event by event basis. It affords a high level of legal protection to the caterer by including strict paragraphs on the provision of insurance and consequent acceptance of full liability. It reduces the risk that clients might blame you for things outside of your control or as a result of a misunderstanding. It can be used regardless of the range of services you offer, and for any type of function. You might be offering a five course cooked meal matched with wine and table service at a wedding, or a cold self-serve buffet at a marketing event. It can also be used as an umbrella contract for recurring work, such as regular provision of sandwiches for a client's monthly board meetings, or even on an adhoc basis as required.